Want to enjoy soft, smooth skin and your hot tub too? Of all the maladies we tend to suffer through the fall and winter months, dry skin might be the most persistent. Whether you spend time indoors or out, there are plenty of ways your skin can take a beating…including soaking in hot water. If you’re a hot tub lover, you needn’t fret. There are ways to enjoy your daily soak, while keeping your skin soft and smooth. Keeping your hot tub at the correct pH level is a place to start. Ever so slightly on the alkaline side…7.2 & 7.8… is ideal. Any pH lower than this, and the acidity can draw the moisture right out of your skin. When you’ve finished your soak, be sure to towel dry with light patting, rather than by rubbing your skin. The extra friction is not skin-friendly. We recommend using SilkBalance. 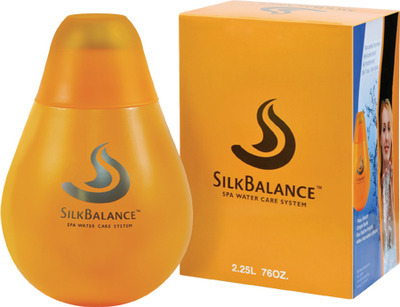 One of the benefits of SilkBalance is that it softens your skin while you soak in your hot tub. Another advantage is its ability to keep your spa water’s pH level within the proper range, 7.2 to 7.8 without the need to test and rebalance. These benefits, plus the ease of use, make this product worth the price and then some! If you own a Hot Spring Spa think about retrofitting your hot tub with the ACE Salt Water System. Compared to traditional hot tub chemicals, soaking in salt water is far and away a better choice for your skin. Salt water is softer, which counters the drying effects of soaking. There are also certain anti-ageing benefits to soaking in salt water. Lastly, help restore your skin’s natural moisture and suppleness by using a good lotion after your soak. A quality product with vitamins, moisturizers, and lipids like Gold Bond’s Ultimate Restoring Coq10 Lotion, can make a difference. Harsh fall and winter weather can be hard on your skin. But that doesn’t mean you can’t have your daily soak, and softer skin as well. Just follow our helpful hints and should be able to enjoy both.